Lubrite Industries is the largest manufacturer and exporter of Dual Line Lubrication Systems from India. 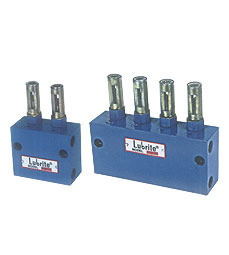 Dose Feeders are the dual line adjustable measuring valve blocks employed in the Centralised two - line Grease Lubrication System to deliver measured quantity of lubricant to the bearing points under preset pressure. These are mounted across the two lines and outlet are connected to the bearing points by means of suitable pipe line. 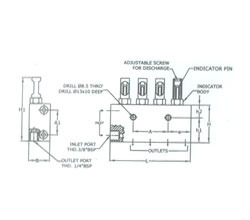 Grease inlets are L1 and L2 and grease outlet is O. During one cycle, grease enters through L1 and subsequently pushes the shuttle valve V up, there by opening port P1 via the under cut of the shuttle valve V. Grease now enters through port P1 into the bottom of chamber C and pushes piston P up. 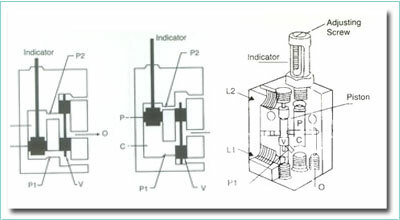 Consequently, grease collected in the top of chamber C during the earlier cycle is pushed out by the piston P in its upwards movement through port P2 via the under cut of shuttle valve V, Horizontal cross bore and finally out of the feeder through O.In the next cycle similarly grease enters through L2 pushes shuttle valve V down enters top of chamber C through port P2 pushes the piston P down, thereby driving out the grease collected in the bottom of chamber C during the first cycle through port P1 via shuttle valve under cut, horizontal cross bore and finally out through outlet O.